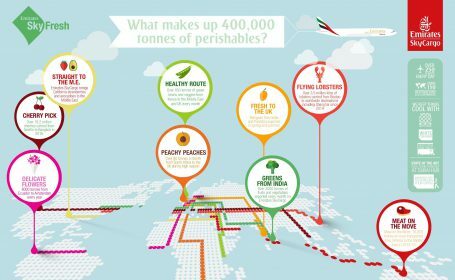 Emirates SkyCargo, the freight division of Emirates, has launched Emirates SkyFresh – a suite of solutions that help maintain the freshness of perishables and fresh consumables during transportation. Emirates SkyFresh brings together Emirates SkyCargo’s state of the art infrastructure at its hub in Dubai, a modern fleet of wide-bodied aircraft including freighters, a range of innovative cool chain solutions including the brand new Ventilated Cool Dolly and experienced staff to ensure that perishables such as fruits, vegetables, fresh fish and seafood, meat and flowers maintain their freshness during the entire air transportation process. Emirates SkyFresh will feature three levels – Emirates SkyFresh, Emirates SkyFresh Breathe and Emirates SkyFresh Active – offering varied levels of cool chain protection for different kinds of perishables. The basic solution, Emirates SkyFresh, is geared towards temperature tolerant fruits and vegetables and will offer quick ramp transportation and thermal protection through Emirates SkyCargo’s White Cover blanket. Emirates SkyFresh Breathe provides protection for temperature sensitive perishables such as fresh cut flowers, ready to sell cut fruits and vegetables and fresh fish. Unique features will include prioritised ground handling as well as the use of the Emirates SkyFresh Ventilated Cool Dolly. Emirates SkyFresh Active will offer the highest protection for perishables that cannot withstand any temperature deviation using specialised temperature controlled containers during transportation. The Emirates SkyFresh Ventilated Cool Dolly is Emirates SkyCargo’s latest innovative cool chain protection product which helps preserve the freshness of perishables that require constant circulation of fresh cool air. The Ventilated Cool Dolly not only maintains a constant temperature while transporting cargo, but also has a ventilation system that allows it to bring in fresh air from outside. The fresh air is then cleaned using custom built filters, cooled and then circulated inside the refrigerated interior where the temperature sensitive perishable cargo is stored. The Ventilated Cool Dolly features aluminium and PU insulated panels and can carry a weight of up to 16 tonnes. The Ventilated Cool Dolly can fit a variety of belly hold/ lower deck Unit Loading Devices (ULDs), including pallets, in its interior. Transporting perishables is an important part of business for Emirates SkyCargo. People all over the world are increasingly aware and interested in culinary flavours and produce from different countries and regions. In line with this trend, the catering and hospitality industry globally has also been offering more international dining choices to customers. More and more perishables from different parts of the world are shipped by air to ensure that the products arrive fresh and within a short span of time at the destination. In 2016, Emirates SkyCargo transported close to 400,000 tonnes of perishables across its global network of over 150 destinations. This included products as diverse as salmon from Norway, strawberries from California, flowers from Ecuador, meat from Australia, mangoes from the Indian subcontinent, wine and cheese from France. Emirates SkyCargo is an important facilitator of global trade in perishables and helps make an important contribution to local exports. Since 2015 Emirates SkyCargo has brought over 20,000 tonnes of perishables exports from the US to the rest of the world. Some of the most important exports from the United States include cherries from Seattle, lobsters from Boston, fruits and vegetables such as strawberries and avocadoes and asparagus from California, meat from Texas and fruits such as oranges from Florida. These exports travel on Emirates SkyCargo’s network and reach their final destinations across six continents. Similarly, the carrier helps Australian food exporters bring a range of Australian products from meat to cheese to the Middle East and other parts of the world. Over 4000 tonnes of fruits and vegetables are uplifted from India every month and brought to the Middle East and beyond on Emirates SkyCargo. Freighters bring fresh cut flowers from Nairobi in Kenya and Quito in Ecuador to Amsterdam. Emirates SkyCargo operates a modern fleet of 259 wide-bodied aircraft including 15 freighters- 13 Boeing 777-Fs and two B747-400ERFs. The carrier boasts state of the art cool chain facilities at its Emirates SkyCentral cargo hubs at Dubai International Airport and Dubai World Central including over 25,000 square metres of dedicated temperature controlled storage space and dedicated reefer trucks operating 24/7 between Dubai World Central and Dubai International airport.